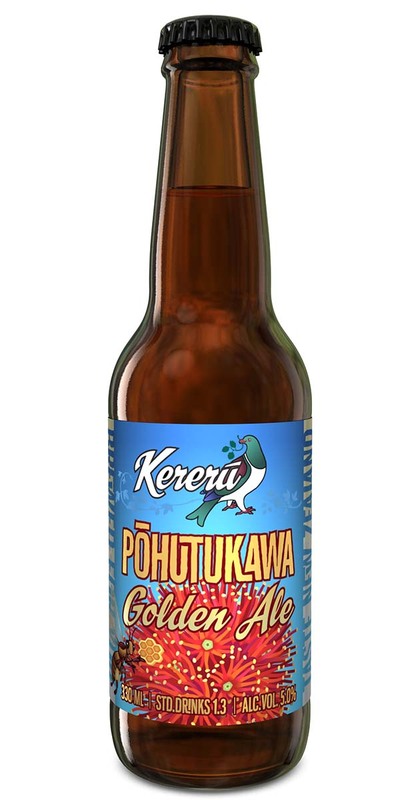 Pohutukawa Golden Ale is a mildly-hopped golden ale with dry mineral notes from the pohutukawa honey. It has lingering flavours of gently toasted malt and NZ Goldings and NZ Cascade (Taiheke) hops. The Pohutukawa tree is the “NZ Christmas tree” with its bright crimson flowers dusting the hills from mid-December. This is the perfect ale for the barbeque and enjoyment during summer. It is also a great beer for cooking with as it is not too bitter and the maltiness accentuates flavours in meats and vegetables. Water, NZ Barley, NZ Wheat, NZ Honey, NZ Hops, Yeast. This slightly toasty and malty golden ale has a generous lashing of pohutukawa (the NZ Christmas tree) honey added to it for a sublte and earthy salted caramel note. It has a nice, clean finish.